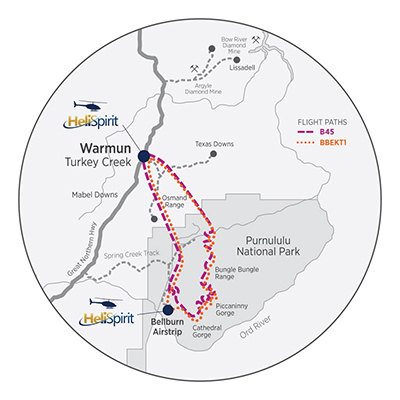 Warmun is 200 km south of Kununurra and 160 km north of Halls Creek . Flights depart from our helipad next door to the roadhouse and our office is near the roadhouse driveway. 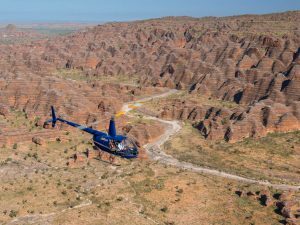 As we take off from Warmun, situated halfway between Kununurra and Halls Creek on the Great Northern Highway, we are but a minute away from the Osmand Range, quite spectacular in its own right as it abuts the World Heritage Listed Purnululu National Park. 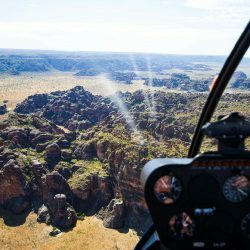 This Bungle Bungle helicopter flight takes in the Red Rock Gorges of the Northern Massif, the Western Wall, Picaninny Gorge and Creek, Deep Gorge and Y Gorge. 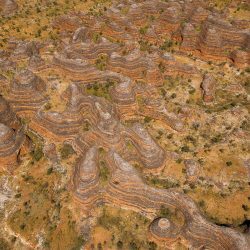 The Osmand Range is one of the Kimberley’s lesser-known spectacular ranges, filled with palms clinging to gorges, waterholes deep in crevasses and endless waves of ancient rocks rolling towards the east. 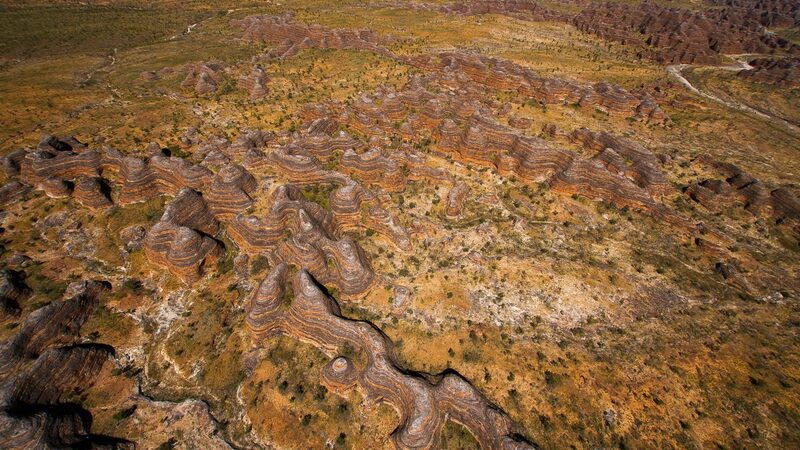 Land and join a guided walk into Cathedral Gorge and the striped domes in Picaninny Creek. The option of an overnight stay. 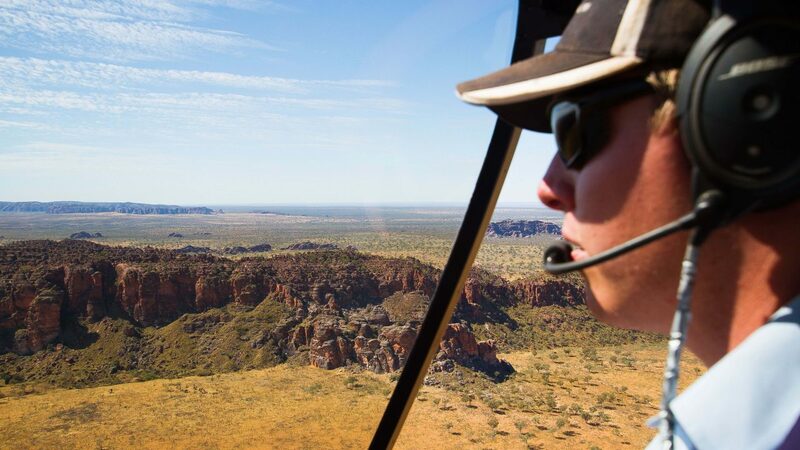 code B45BB1O |Add to B45BB1 – an overnight stay at Bungle Bungle Savannah Lodge. Adult: $1443 Child $1298. All meals are included and accommodation is in an ensuite safari cabin. Departure is after breakfast on day 2. 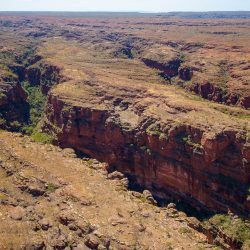 Add a guided walk tour to Echidna Chasm and the Western Wall. The option of an overnight stay. 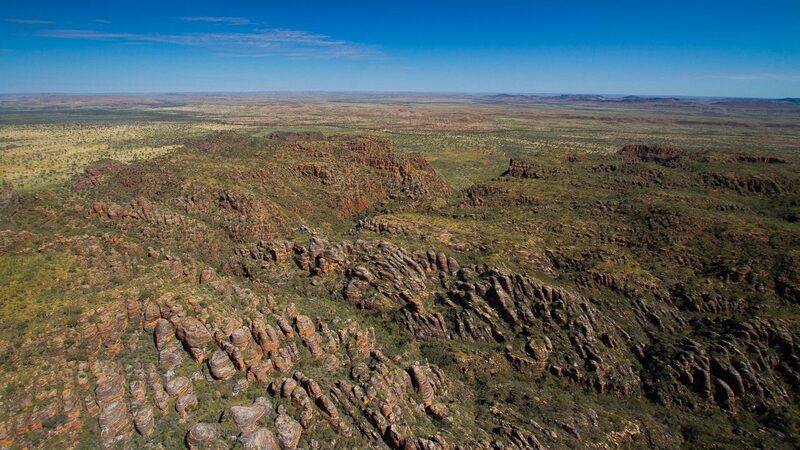 code B45BB3O |Add to B45BB3 –add an overnight stay at Bungle Bungle Savannah Lodge. Adult: $1594 Child $1355. All meals are included and accommodation is in an ensuite safari cabin. Departure is after breakfast on day 2. 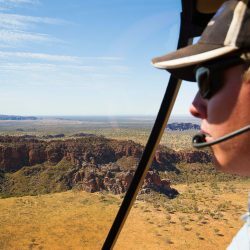 Departing Warmun, take a spectacular scenic helicopter flight over the Osmand Range and the Bungle Bungle, landing in Purnululu national park. 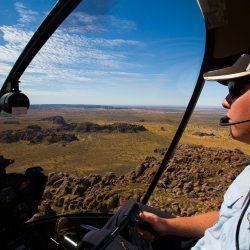 Collect your guide and fly on to land near the mouth of Picaninny Gorge. 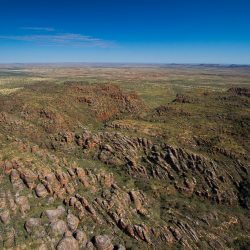 A 10km return hike takes you through the creek bed between the towering walls of the otherwise inaccessible gorge. 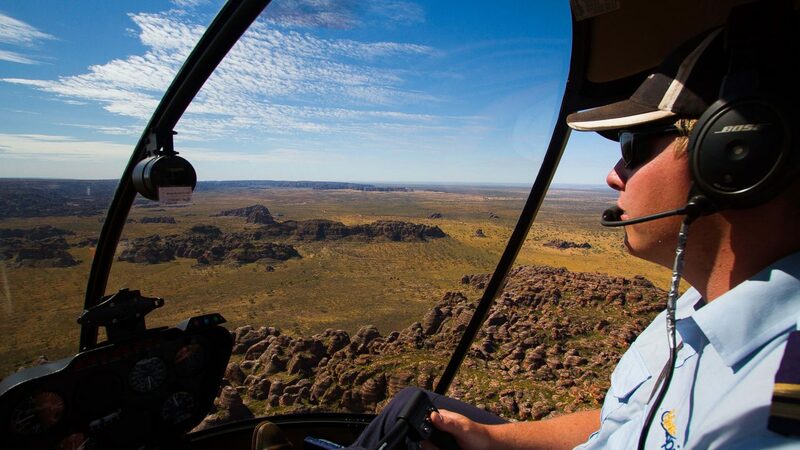 Return by helicopter with stunning views of the sunset on the ranges. All water and food must be carried. There is no marked path as this is a walk not accessible other than on this tour or on a 3-day hike. Spectacularly magnificent, this adventure is for experienced hikers with a high level of fitness. Call us on 91687 337 ( April to October) or 08 9168 1101 (November to March) to book or contact us here. Our office is at the Warmun Roadhouse, which is the halfway point between Halls Creek and Kununurra. The roadhouse is owned by the local Aboriginal community and offers a convenience store, fast food outlet, sit down restaurant, petrol and diesel fuel outlet as well as accommodation choices. You can choose from the shady caravan park, standard motel style rooms or fully self contained motel units. Click here to find out more. 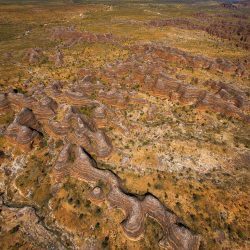 The southern domes of Purnululu. 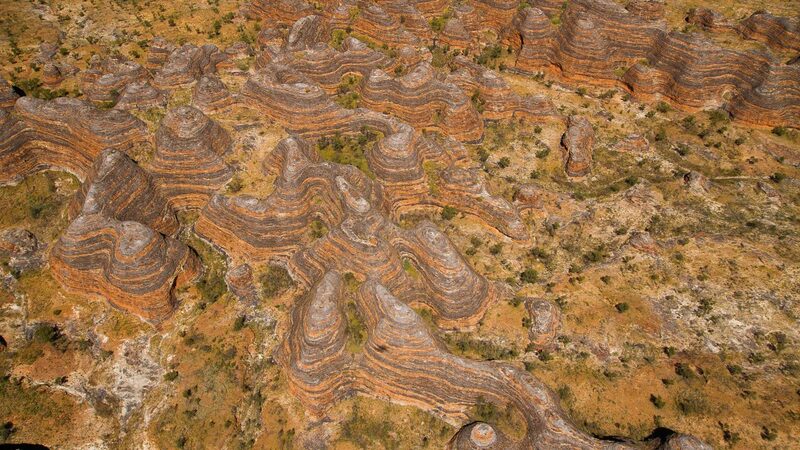 The beehive shaped sandstone domes of Purnululu. 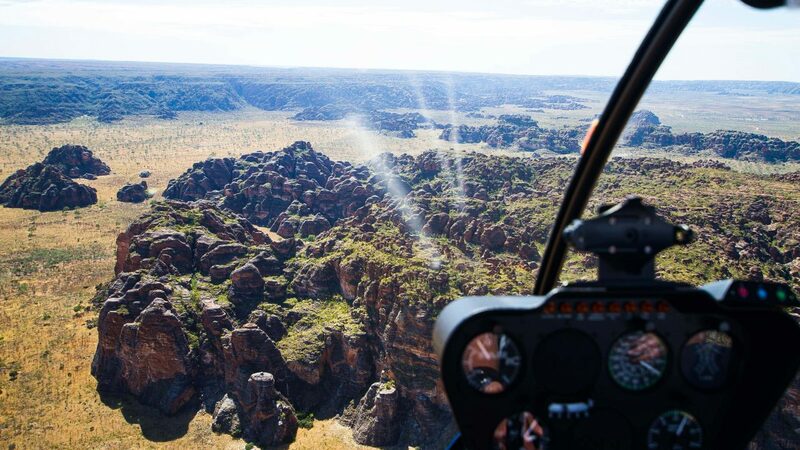 The top of The Bungle Bungle massif by HeliSpirit. 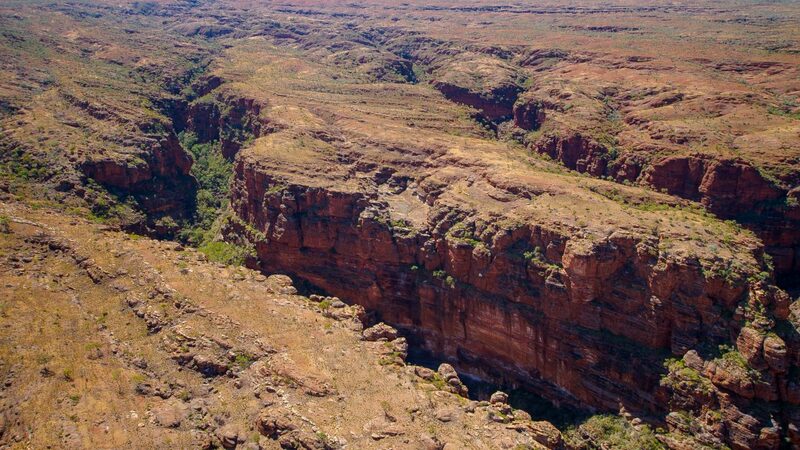 Th western gorges of Purnululu .